Partimus Blog › Fun, Pizza & Ubuntu Linux at a public school! We did some really great work today, and had fun doing it! The 7th grade social studies teacher is going to use the machines for student video editing. The 6th grade social studies teacher is going to use the machines for student research. The 5th grade math teacher is going to use the machines for student math practice. This is a really meaningful contribution to public schools that otherwise would not have the money to get computers into these teachers’ classrooms! Thanks everyone for the great work that you did today! There will be plenty more events like this one, if you didn’t get a chance to come today! This was written by Christian Einfeldt. Posted on Monday, August 8, 2011, at 1:53 am. Filed under Uncategorized. 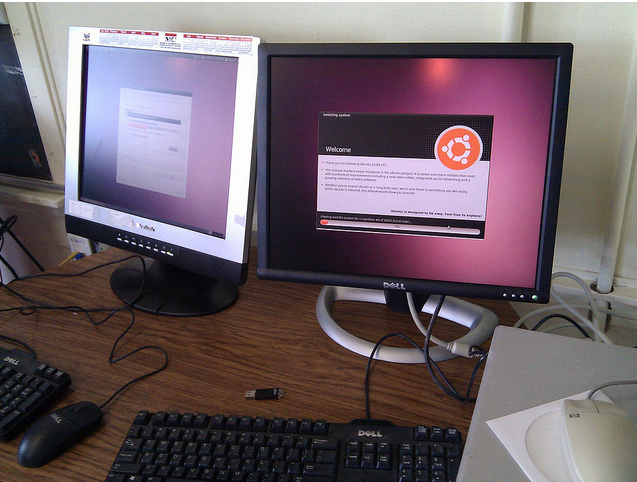 Tagged Linux in public schools, public schools, Ubuntu. Bookmark the permalink. Follow comments here with the RSS feed. Post a comment or leave a trackback. ‹ Teaching teachers how to share software, one computer at a time.